Moderni ylellinen huvila, jossa on uima-allas ja upeat merinäkymät. Tämä hiljattain rakennettu ylellinen huvila on todella viihtyisä ja hyvin pidetty. Ympäristö on järjestetty 3 kerrosta merenpinnan maksimoimiseksi. Pohjakerroksessa on iso moderni keittiö / ruokailutila (varustettu uuni, mikroaaltouuni, astianpesukone, jääkaappi, liesi, osmoosi vesijärjestelmä), jossa on parivuode ovelle puutarhaan ja uima-allas (porealtaalla) : ihanteellinen paikka rentoutua drinkin kanssa ulkoterassilla. Täällä voit myös nauttia viihtyisä ulkoalue, jossa on grilli, aurinkotuolit, suihku, sateenvarjo, jossa voit viettää miellyttäviä hetkiä. Myös pohjakerroksessa on 2 kahden hengen makuuhuonetta (2 kylpyhuonetta, joista yksi kylpyhuone ja yksi käytävällä) tyylikkäästi sisustettuja ylellisiä, joista näkymä puutarhaan ja uima-altaalle. Pääsisali sijaitsee ensimmäisessä kerroksessa paremman panoraamanäkymät; Itse asiassa se on suuret ikkunat kolmelta puolelta, joiden avulla voit nauttia upeasta valosta ja upeasta 180 asteen näkymästä merelle. Oleskelutilassa on TV, DVD ja 2 satelliittidekooderi (yksi Sky English -standardin katselemiseen ja toinen Sky Italia -puhelimelle). Tästä lounge-tilasta pääsee 2 isoa kalustettua terassia, jotka ovat täydellisiä katsella merta ja veneitä auringonlaskun aikaan! Kellarissa (jossa on itsenäinen pääsy) on iso olohuone (sohvalla, TV-alue, Hi-Fi-stereot), iso kahden hengen huone (jossa on mahdollisuus erottaa sängyt), kylpyhuone kylpyammeella ja erillinen pesutupa. Tällä alueella on myös oma patio ja portaat, jotka johtavat allasalueelle. Villa on myös 2 pysäköintipaikkaa varjossa, aivan talon ulkopuolella. Mahonin lentokenttä on 10 minuutin ajomatkan päässä Villa, Sant Luis on paikallinen kaupunki pääsee noin 8 minuutissa autolla. Pääoman pääoman saavuttamiseksi kestää 15 minuuttia. Julkinen liikenne ei ole kovin tehokasta, joten on suositeltavaa vuokrata auton lentokentällä. Hämmästyttävä ja ylellinen hotelli vaativimmille asiakkaille. Kylpyhuone (1), jossa suuri suihku, wc ja pesuallas. Kylpyhuone (2), suihku, wc ja pesuallas. Kylpyhuone kellarissa (3) täydellinen ylellisyyttä amme, pesuallas, wc ja bidee. Ja "mahdollista tupakoida ulkoalueiden! Se yhdistelmä turvallinen. Omaisuus on saatavilla ihmisille pyörätuolilla pohjakerroksessa vain. Ovat edelleen rakentuu kolmesta tasosta ei suositella liikuntaesteisille vaikeuksia. Maison spacieuse et agréable pour 6 adultes, bien équipée, propre et bien distribuée au point de vue des pièces. Jardin et piscine appréciés. Le salon situé au premier étage permet une vue panoramique sur les terres et surtout sur la mer. très bon accueil de la personne chargée de la réception. Cette maison est proche d'une plage agréable et accueillante, proche de l'aéroport. Ce lieu de résidence nous a permis de bien rayonner dans toute l'ile et grâce aux informations fournies par Giorgia, nous avons pu découvrir toute la beauté et les charmes de cette l 'ile,ainsi que la gentillesse des Minorquins. Nous reviendrons et surement dans cette même résidence, si elle est disponible. Merci beacoup Jacques, ce fut un plaisir de vous accuellir chez moi! La casa si trova in una zona tranquilla e ben servita (due ristoranti raggiungibili in pochi minuti a piedi) è comunque consigliabile l'auto per godere della bellezza di Minorca. La spiaggia vicino a casa (raggiungibile a piedi in pochi minuti) è molto carina. La villa è molto spaziosa e ben curata con una bella piscina (ben manutenuta e soprattutto con molta privacy) e due bellissime terrazze vista mare. La cucina è completa di tutto. Vicini molto silenziosi. Buon l'arredamento e cura della villa, così come il servizio di pulizia. Giorgia è stata impeccabile nella gestione della prenotazione e nel fornirci tutte le informazioni prima del nostro arrivo. Per completezza segnalo che diversi aerei atterranno o decollano passando proprio sopra la casa, ma non ci hanno procurato alcun fastidio, tanto meno di notte. Impianto di climatizzazione efficiente (molto gradite anche le ventole a soffitto). In conclusione ci siamo trovati veramente molto bene e contiamo di ripetere l'esperienza. Grazie mille per aver soggiornato nella mia struttura e grazie infinite per la recensione positiva. Vi aspettiamo di nuovo quando volete! To spend a literally PERFECT holiday in Menorca! 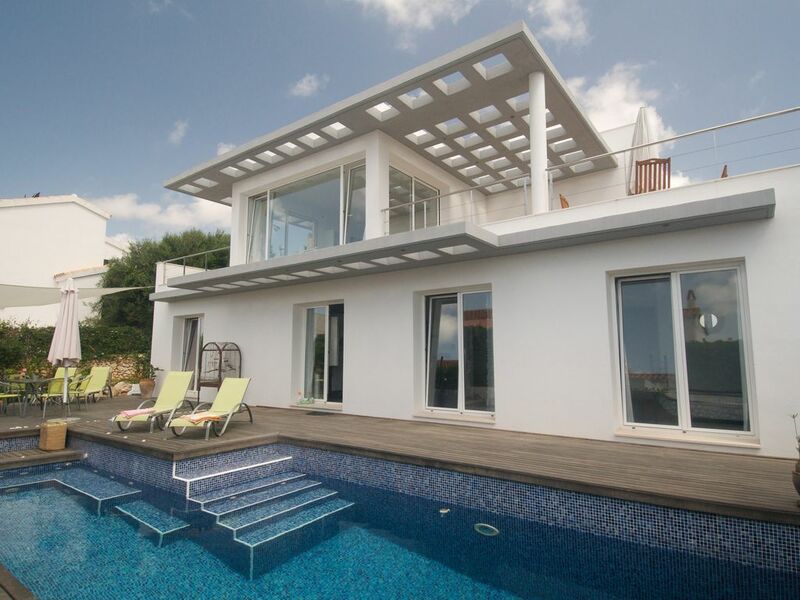 Villa Binimita is an excellent accommodation to discover the fantastic island of Menorca. I spent the week of 29th July – 04th August 2018 there and we were three couples together with a little one-year-old baby. The first benefit you’ll appreciate as soon as you land on the island is that the house is very close to the airport, so you can move from/to it very shortly and fast. Then when you arrive in Carrer De Dalt 16 the Villa is exactly as you can see in the photos and read in all the descriptions on its website. It’s built in a very peaceful and green residential area, it has two private boxes to park your car, it is very large, elegant, clean and tidy. It is modernly furnished with every comfort you need during your holiday and its location is perfect for everything you want to do. It is air-conditioned well in every bedroom, especially in the one downstairs in the lower floor, where I slept during my stay. The great lounge at the third floor overlooks all the south coast of Menorca. The Villa is the ideal solution for your holiday either with a numerous family or a big company of friends, because it offers the right balance among individual own needs of privacy and the pleasure to share your time with others. The swimming pool outside is a fresh pleasant oasis always ready to heal you from the summer high temperatures. Every night you’ll be amazingly surprised by the unspoiled sky full of glittering stars above your head while you’re lying down at the poolside. The sound of airplanes travelling over your head will soon keep company without disturbing you too much. As regards beach life, the water of the sea is unpolluted and limpid everywhere. Es Caló Blanc and Binisafuller Playa are the two nearest sites to the Villa where you can dive into the sea: the former is a cliff, the latter is a sandy beach. But there are a lot of beaches to visit and change every day moving all around Menorca and I do suggest you do it as the house is in a good position to tour all the island. For your night life, shopping or good fish dinners, both the two biggest cities of Menorca - Maò-Mahòn and Ciutadella ¬- are easily reachable from the Villa and very beautiful. The precious suggestions and the prompt efficient service which the caring owner of the Villa gave us since we arrived till we left helped us to feel at ease in the house and to have a wonderful time in Menorca. Thank you Giorgia! Giorgia, Thanks a lot, we arrived safely and really relaxed. It was a great time at your house and had a pleasent stay on the beautiful island. Our first but for sure not our last time. We will recommand your house and share your link with our friends. Many thanks and also to Giovanna, she was very friendly and welcome us. Thank you so much Christian, it was a pleasure to have you there and I hope to hear from you again for another wonderful holiday! Giorgia's beautiful villa was perfect for our family of four plus two of my daughters' friends. Luxurious, spacious, spotless and extremely well appointed - a real home from home! Further advantages are a beautiful pool, excellent patio with bbq and sun loungers and a fantastic terrace on the top floor for beautiful views and stargazing! Well located in a lovely residential area within walking distance of 2 beautiful beaches. Giorgia was a pleasure to deal with as regards the booking and any questions we had - always replied very promptly - and her housekeeper, Giovanna made us feel very welcome, too. The bottle of wine was much appreciated! Menorca is a gem of an island, very clean, beautiful beaches and excellent restaurants. We explored the island a great deal and would love to return in the future and stay at Villa Binimita. I will certainly recommend it to my family and friends! Thank you, Giorgia - we had the perfect holiday! Thanks for your stay! I’m glad you’ve loved the villa and the island and enjoyed your holiday. Thanks for this important feedback! Hope to hear from you again for a new holiday! La casa è molto carina, ben tenuta e con una bella vista mare dal piano superiore. La sig.ra Giorgia ci ha illustrato tutto, dalle spiagge, ai ristoranti, alle meraviglie dell'isola, il tutto con estrema accuratezza.....mentre la sig.ra Giovanna ci ha accolto con ulteriori informazioni relative all'abitazione. Il soggiorno è stato molto piacevole quindi la consiglierei senza alcun dubbio. Grazie mille per essere stati miei ospiti. Sono felice che vi siate trovati bene e che la villa sia stata come da vostre aspettative. Vi aspetto di nuovo quando volete! Sijainti on hyvä nauttia sekä meren elämää, molemmat kävelee.